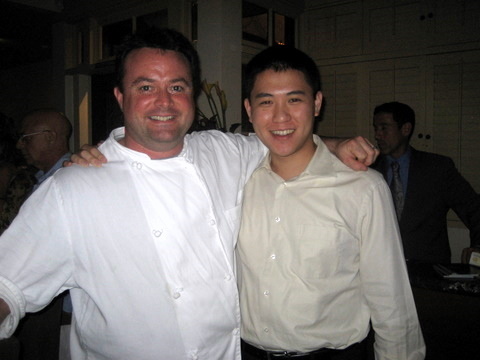 The second in the 2008 5x5 Chefs Collaborative Dinner Series was held at Mélisse Restaurant. I made reservations for this dinner the day after the 5x5 Dinner at Providence and I am glad I did. We arrived thirty minutes early for our 9:00PM reservation and were told they would be seating true to time. The restaurant was totally packed we couldn't even wait at the bar because they were seating diners there. I noticed at Providence all the chefs came out at regular intervals to greet guests, this seemed less frequent at Mélisse and I expect it was because they were busy in the kitchen. Sadly one of our dining companions could not join us this evening. One of my other companions ended up ordering a Mojito in his place. 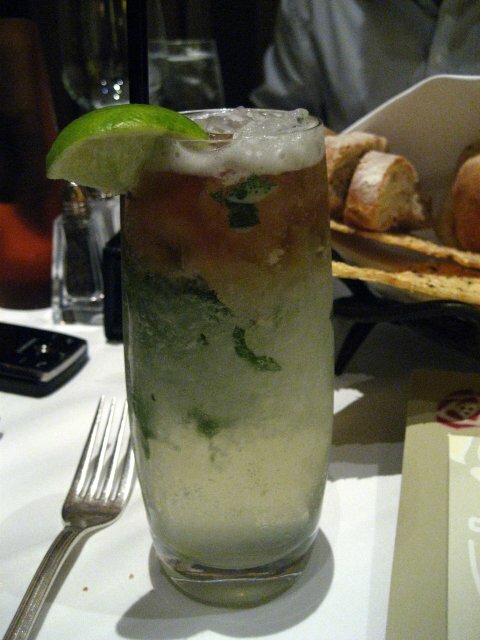 The drink was quite good with a nice even balance of mint and sweet citrus notes. 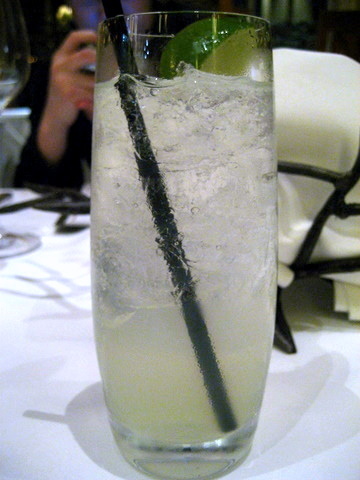 I went with a Tom Collins after they told me they couldn't make a Cucumber Gimlet. The Collins was quite stiff with a strong taste of juniper berries and fresh lemon, quite refreshing. 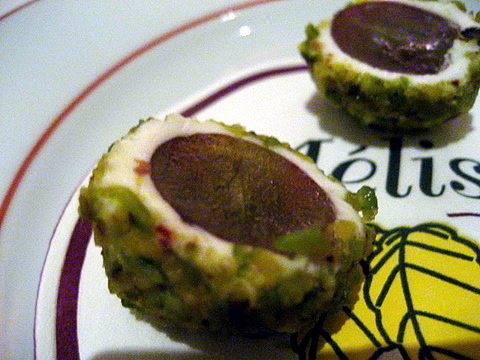 It wouldn't be a meal at Mélisse if it didn't begin with something covered in goat cheese and pistachio. The mix of flavors tantalizes the tongue and hints at future delights coming presently. 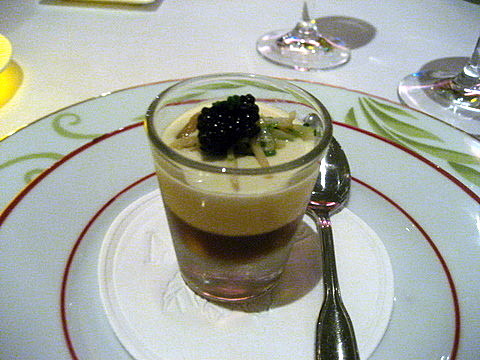 A delicious amuse, combining caviar, abalone, sea urchin cream, and lobster geleé. Given all the ingredients were from the ocean, I thought they worked very well together. The sea urchin cream was rich with just a hint of sweetness. Meanwhile the lobster geleé had the subtle richness of lobster. 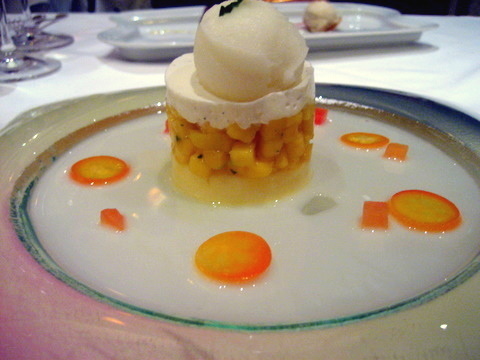 The caviar provided a saltiness that was balanced by the softer flavors of the geleé and cream. Lastly the abalone added a nice snappy texture to the mix. I found it interesting both the 5x5 dinners had a sea urchin cream in the amuse, but that may just be coincidence. Easily the best cooked hamachi I have ever had. 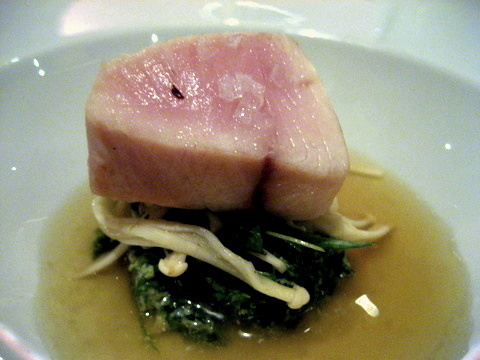 Hamachi is one of my favorite fishes to eat raw, I really like the clean oiliness. Previously when I tried the cooked fish, I found it dry and flavorless as if the oil had all been cooked out. This was ever so lightly seared, giving the oils a fuller flavor that I quite enjoyed. The heaviness of the oils is balanced by a light tartness in the spinach. The wine was a nice dry rosé with a bit of berry on the nose, very similar on the palate with maybe a hint of minerality. This was such a decadent course, lobster and truffles. Sadly the execution was a bit flawed. The texture of the lobster was overly soft although I did enjoy the flavor of the truffles combined with the lobster sauce. The wine had quite a bit of stony minerality and steel notes, with high acidity and some tart fruit. I have a hard time picking between this and the hamachi as the course of the night. 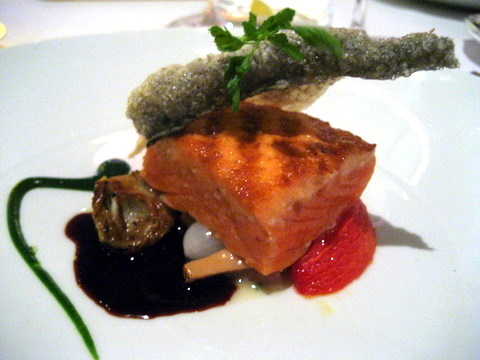 The salmon was cooked very rare with the skin baked to a crisp. The wine sauce was a mix of 70% cabernet sauvignon and 30% port, slightly sweet and accenting the distinctive character of the salmon wonderfully. The wine was a very complex pinot, plenty of leather along with some spice and earth, maybe a bit of black cherry, definitely not easy drinking. The pork was so tender and flavorful (fatty) I felt guilty for eating it even as my eyes glazed over with pleasure. The egg was lightly cooked and breaking the egg caused a rich layer of yolk to flow over every bit of the pork, the two together tasted very much like what breakfast must taste like in heaven. 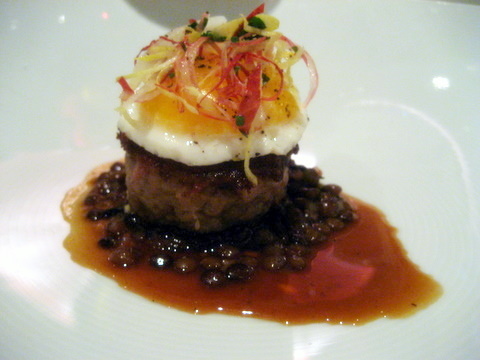 The lentils felt superfluous, as if they were only there to tone down the intensity of the pork and egg. The CDP was very fruit forward with lots of raspberry and cherry with soft tannins and a little bit of spice and earth, probably my favorite of the night. This course just didn't really do much for me. I typically find venison too lean and this was no different although it was quite tender. In addition the meat had a gaminess than lingered on the tongue that I found quite unpleasant. 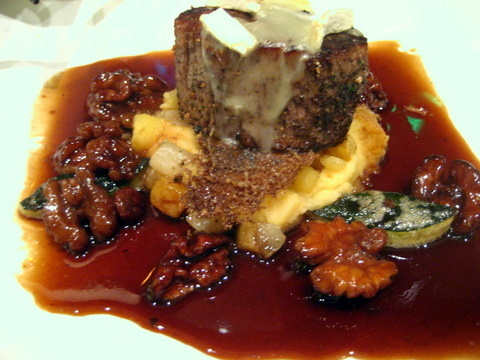 The sauce was very dark and earthy, also drawing on many of the same flavors that are in the venison. The wine as a very old-world style blend, well-balanced with a good amount of fruit on the nose with some tobacco, really firm tannins, quite complex. I don't know why the peach headlined this dessert. I felt most of the flavor came from the citrus (I think lime) sorbet. Which sat atop a sweet sticky cookie. The rolled crisp was filled with a mousse that tasted intensely of condensed milk, which provided a very rich foil for the peach. The wine paired with this was a Kabinett that I have enjoyed many times although never with dessert. 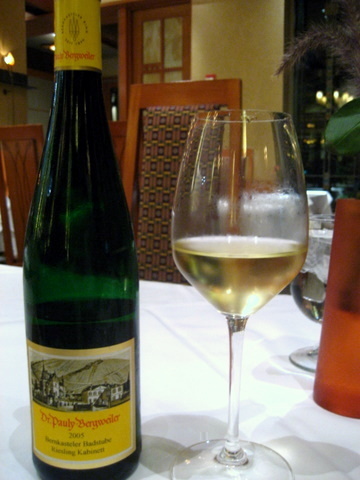 The wine is quite sweet for a Kabinett with lots of young fruit, peach and apple along with some minerals. The chocolate milk was a nice break from the plethora of chocolates or pastries usually presented to close out the meal. 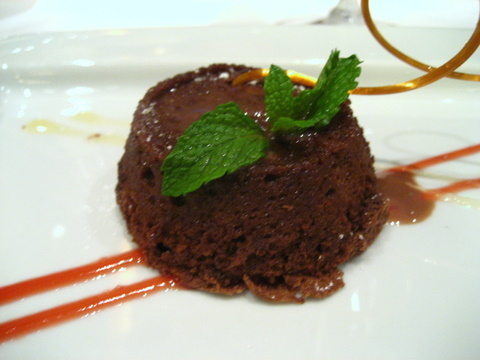 Cool and thick with a velvety texture that coats the mouth in a layer of pure chocolate flavor. The two chocolates were quite good as well. 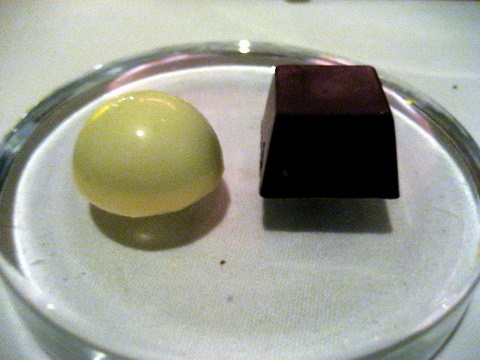 The passionfruit filling inside the chocolate was really powerful a wonderful explosion of flavor. The basil was not quite as bold but still quite delicious. I'd much rather have one or two chocolates of this caliber than a full plate of mediocre sweets. I must have enjoyed this meal too much since by the time we were done two of the chefs had left and the rest were preparing to leave as well. I was hoping to get a photo with the entire staff but alas it was not to be. 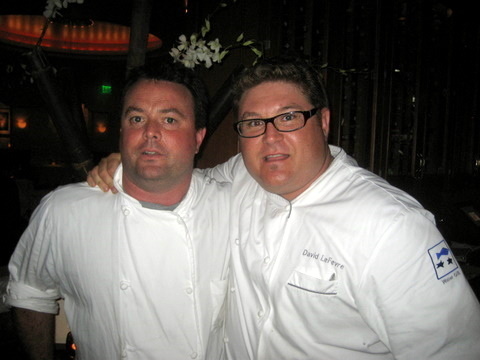 I was able to snap a picture of Chefs Keane and Lefevre together as well as a picture with Chef Keane. Looking for a place to eat on the 4th of July can be a challenge especially when you start looking at 6PM. Fortunately I was able to get a walk-in at Napa Rose for 9PM. Having had the Vintner's Table menu before we wanted to see if we could do something a little different. We decided to put our trust in the chef and have him create a true tasting menu for us. A very appropriate summer amuse, similar to one I had recently at Lola. 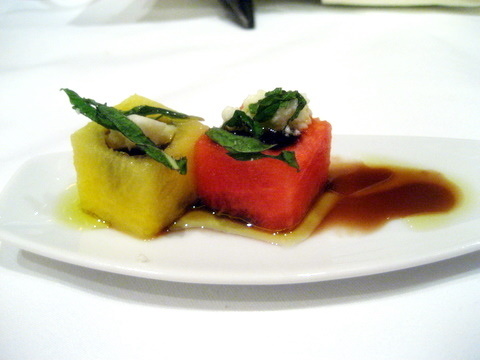 The juicy sweetness of the watermelon is heightened by the balsamic and mint. The cheese had a mild tanginess that went very well with the melon. I suppose we could have asked for the staff to make a wine pairing on the fly but we decided to just go with a bottle of red and a bottle of white. Last time my friend and I came here we walked out with a bottle of 1999 DRC Burgundy. We struck up a conversation about wines with our waiter and he mentioned he might have another 99 for $4800. Sadly it wasn't at the on-site cellar, but he promised to check the off-site and bring it over for our next visit. Last time I was here I ordered a cucumber martini and it was excellent. 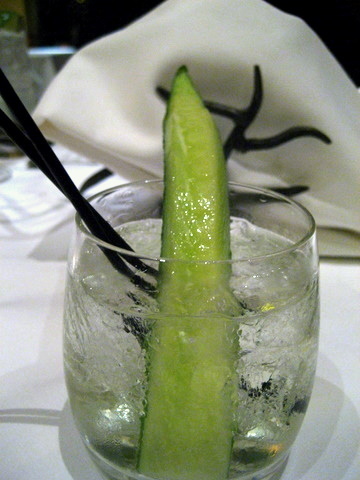 I considered getting that again, but I decided to try a cucumber gimlet instead. 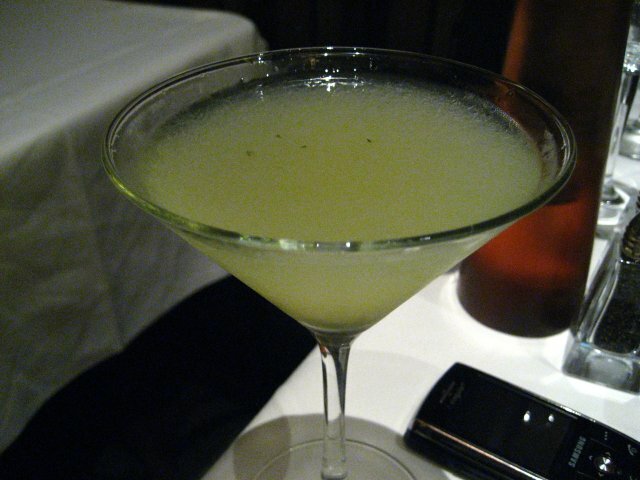 The gimlet tasted like a milder version of the martini, with the lemon adding a slight twist. Since we decided to have the chef make up the menu as he went, we decided not to do wine pairings and instead get a bottle of white and a bottle of red. I was in the mood for a Riesling and the off-dry Bergweiler was just what I needed, lots of apple and minerality on the nose, medium acidity with some sugar, peach and stone on the palate. A very well balanced wine with nice texture and complexity. Black cherry in the nose with some earthiness. 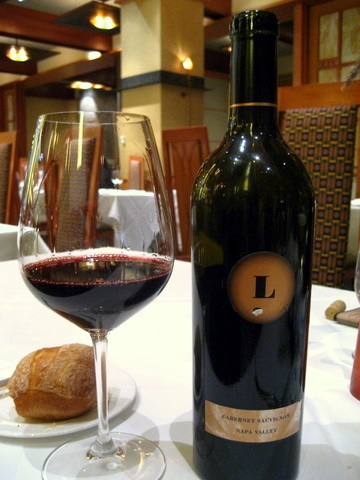 On the palate flavors of cherry and cassis give way to lingering mint on the finish. I enjoyed the wine, but I thought it a bit restrained and would have liked a bit more expressiveness. 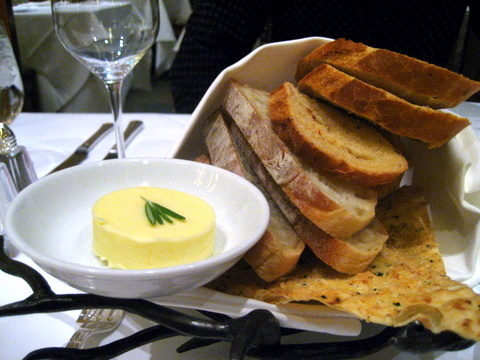 The same 4 bread offerings that are always available. As always the crispy flatbread was my favorite. 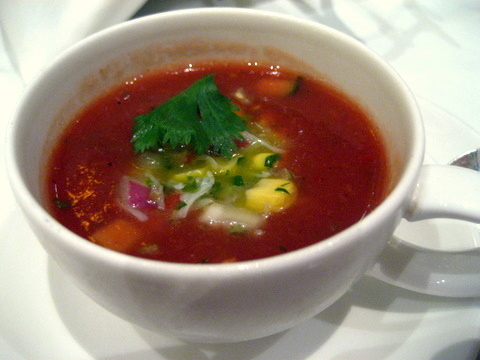 The special soup of the night was a delicious gazpacho with crab. The gazpacho was nicely chilled and bracing with a hint of heat. The corn and crab complimented the soup, balancing the peppery bite of the soup. I wasn't impressed with this dish the first time I came here with my MBA group, I thought the fish was overpowered by the accompanying ingredients. 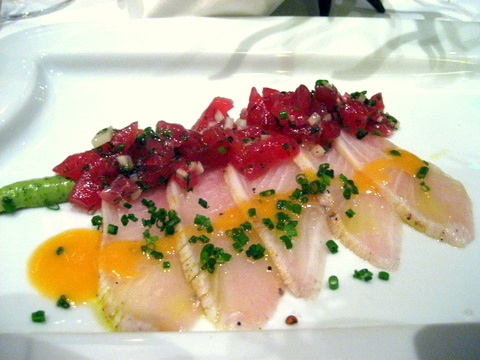 I am happy to say this time things were much better, the citrus was more balanced and there wasn't as much oil on the ahi tartare. A couple bites were a touch salty but still tasty. 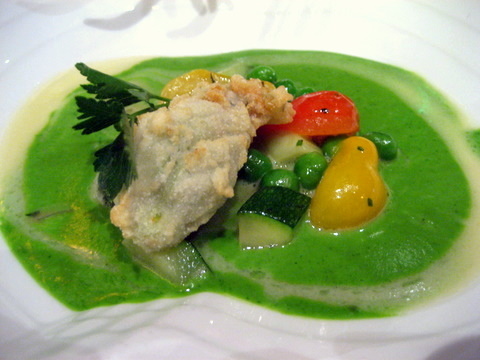 The squash blossom had a clean fried taste to it and went very well with the creamy sweetness of the English pea coulis. 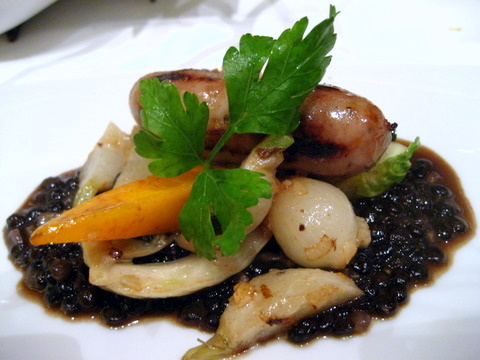 Overall, I quite enjoyed the interplay of texture and flavor in this dish. Lately I am definitely appreciating the things talented chefs can do with vegetables a lot more than I used to. The corn and leek lasagna was surprisingly good, fairly simple and pleasing to eat. 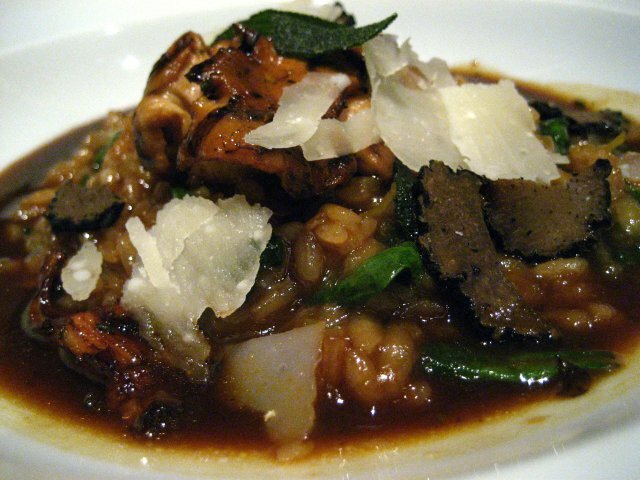 The dish became much more complex with the addition of smoky bacon and earthy mushrooms. 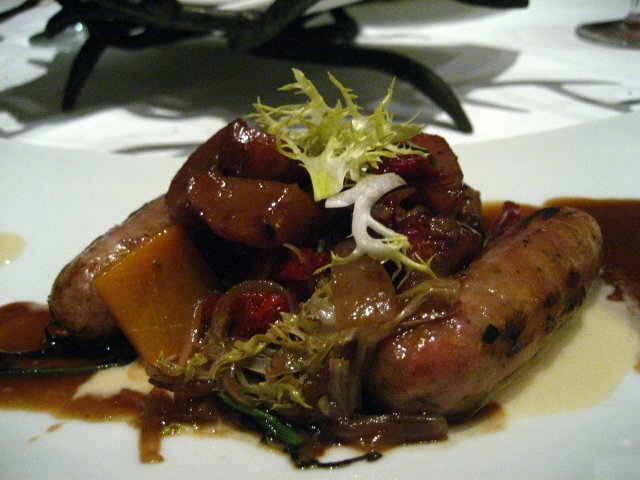 The standout part of this dish was definitely the bratwurst itself with its rich flavor. The sides were a bit bland although I did enjoy the texture of the lentils. Both times I had this dish the sides were very mild in flavor maybe this is done intentionally to let the bratwurst take center stage. I thought the risotto was a bit better this time around. The sauce was a touch salty but the texture was much better. I would have liked a slightly stronger truffle flavor though. I would have been happy eating this steak just by itself. The meat was faultless, tender with no tendon or gristle, truly a joy to sink your teeth into. The flavor was just as strong, minimal fat but a clean hearty beefiness. I didn't eat much of the sides or the sauce as they detracted from the purity of the meat. One of the most impressive courses of the night. 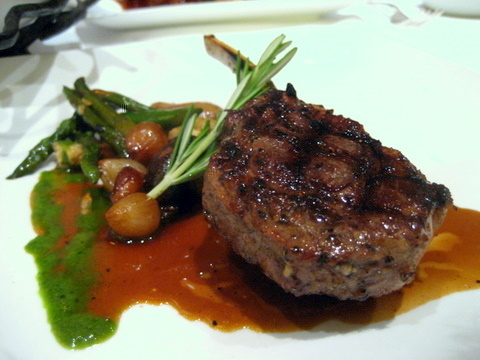 The lamb was phenominal, tender and flavorful, a good balance of fat and lean meat. The flavor was characteristic of lamb, but with minimal gaminess. For some reason the descriptions of the desserts totally elude me, so I am going based on the picture. 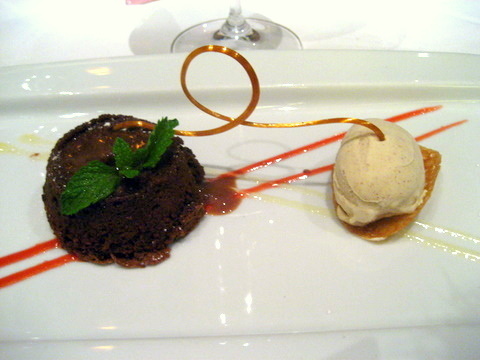 This was a fairly typical warm chocolate cake with ice cream and a tuile. Nice but nothing particularly memorable. The other dessert was a bit more memorable but I am still going off the picture because I don't remember the description. 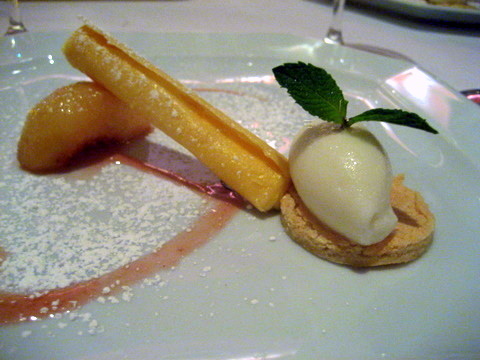 The peach parfait was delicateand light, very mild in taste. The flavor came mostly from the rest of the dish. The granita on top was citrus based, I think lime, very tart and the perfect foil to the buttery rich cream. 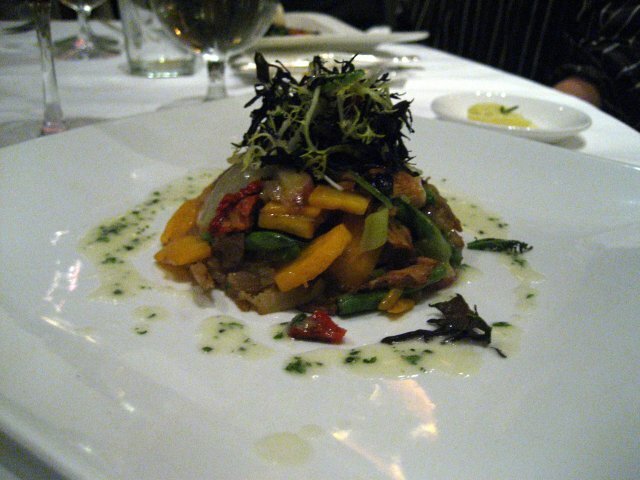 The sliced kumquats had a similar flavor but so intense that it overpowered the other flavors of the dish. Overall, good balance except for the kumquats. 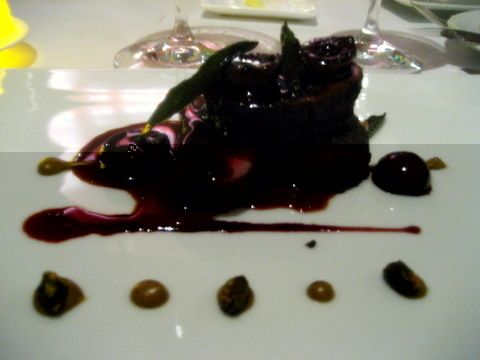 This marks my 3rd review of Napa Rose and my 4th visit, making this the most reviewed restaurant on my blog. My last three visits have all been fairly strong. The one consistent complaint throughout the last few visits is their dark sauces tend to be a bit overpowering. 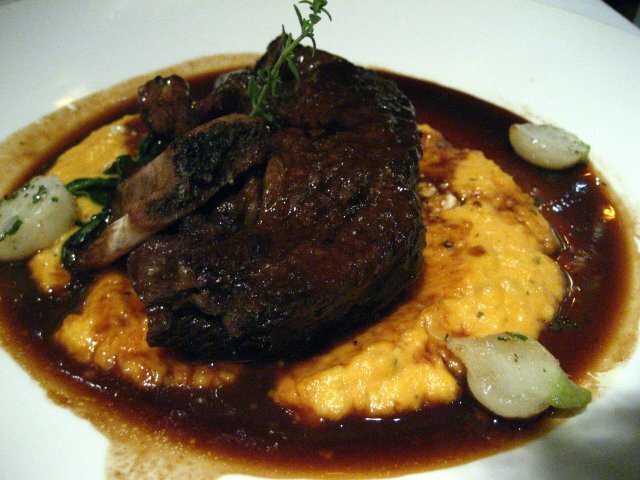 Overall, I'd still classify Napa Rose as one of the best fine dining experiences in Orange County. This is my second trip to Napa Rose in as many months. I had just completed my first quarter of my MBA program (out of nine!) and was about to join a new group. I figured a final dinner with my soon-to-be former groupmates would be a fitting way to end the quarter. I made a last minute reservation for the day after our last final and got a late table, sadly one of my teammates could not join us. We started off the meal with a round of Red Trolley Beer which I discovered I have quite a fondness for. We decided on a bottle of wine to share between the table. My classmates were aware I bought a bottle of $5000 wine my last visit and joked not to select something so expensive. Our server overheard the banter and saw fit to mention a pair of "tourists" recently bought a bottle of $5000 dollar wine. I corrected her, much to my amusement, and let her know that I purchased the wine and I am very much a local. For our dinner, I selected a bottle of Goldeneye Pinot Noir by Duckhorn Vineyards which garnered universal approval from the table. The wine had a vibrant and heady aroma of cherry, earth, and cedar. The mouthfeel was silky-smooth with flavors ranging from strawberry, mushrooms, and pepper. The bread was the same as during my last trip a couple weeks ago. I didn't try much but I imagine it was as good as last time. Not seeing a main course that really caught my eye I decided to order a variety of appetizers to sample the chefs cooking. Most of my classmates selected an entreé with one other choosing an appetizer. A very good presentation of scallops although not quite up to my previous experience at Napa. The sauce was very nice with a mix of sweetness from the corn to balance the acidity of the lemon and the rich flavor of shellfish to mellow everything out. A fairly disappointing course especially given the freshness of the fish. 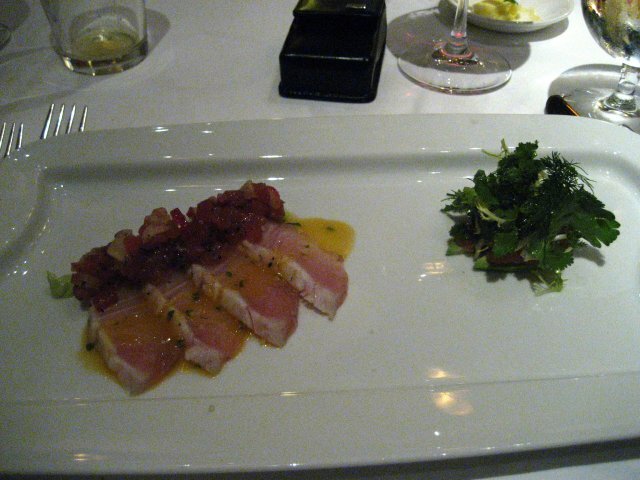 Each piece of kampachi came topped with ahi tartare slathered in some sort of oil. I find tartare in oil to be especially distasteful, the oil masks the natural texture of the fish and robs the taster of the original flavor of the meat. The combination of all the flavors ended up bitter and earthy, not quite the way I enjoy my fish. I ordered this on the recommendation of one of my teammates. Being an employee of Disney, he has dined at Napa Rose on occasion and mentioned this soup is a permanent fixture on the menu. 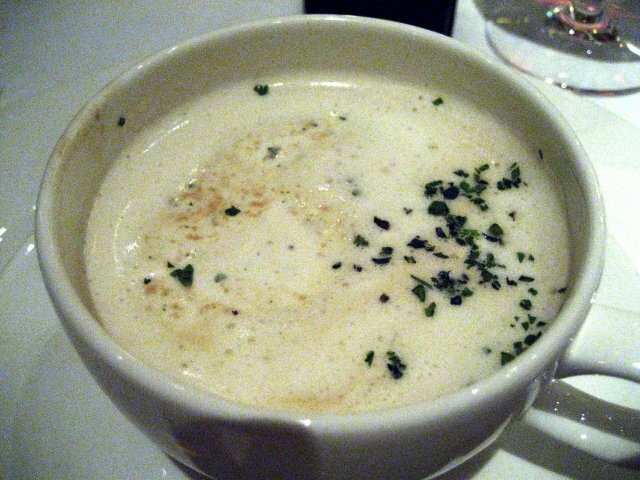 I found it quite good the flavor of the thyme paired well with the mushroom soup. I would have liked the soup a touch thicker, but this was perfectly acceptable. For some reason duck confit always appeals to me more in my mind than in reality. The idea of a duck leg cooked in its own fat sounds delicious but the outcome is always a bit drier than I expect. 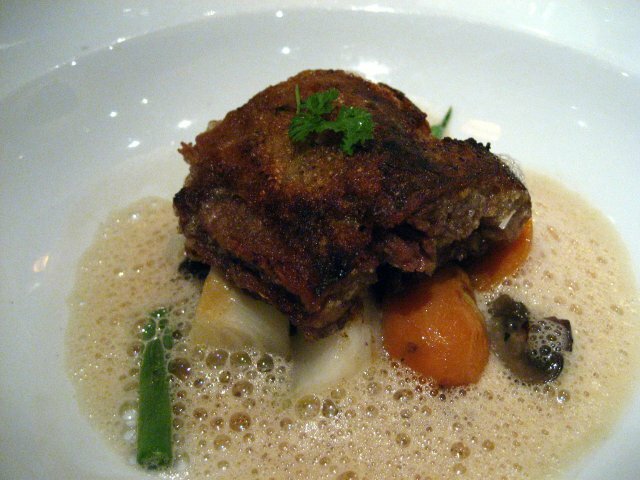 This was a fairly standard confit, dry but very flavorful with a nicely crisped skin. My last course was also a mild disappointment. I felt the broth was too thin and mild and the dough too thick and dense. In the end the course tasted more like sourdough bread than anything else. A shame since lobster and dill sound like a wonderful combination. One of my classmates is a vegetarian. While there are no specifically vegetarian or vegan items in the menu the staff is happy to whip up something tailored to a person's tastes. I did not try this dish but my classmate enjoyed it. A fairly nice piece of fish. The meat was moderately dense yet flaked easily although, the sauce and accompaniments were a touch too sweet for my tastes. Easily my favorite entreé of the night. 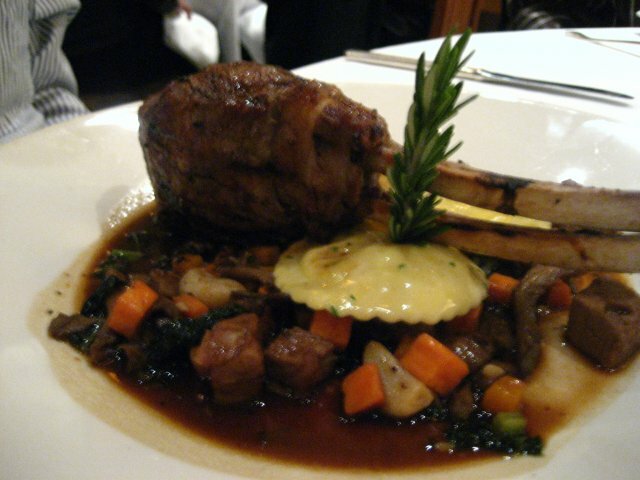 A tender and flavorful lamb chop with a hint of game and paired with a rich earthy medley of vegetables and mushrooms. The sauce added the perfect amount of complexity and the wine felt as if it were made for this course. Having recently discussed the merits of braising short ribs ad nauseam with a coworker I felt eminately prepared to evaluate this course. 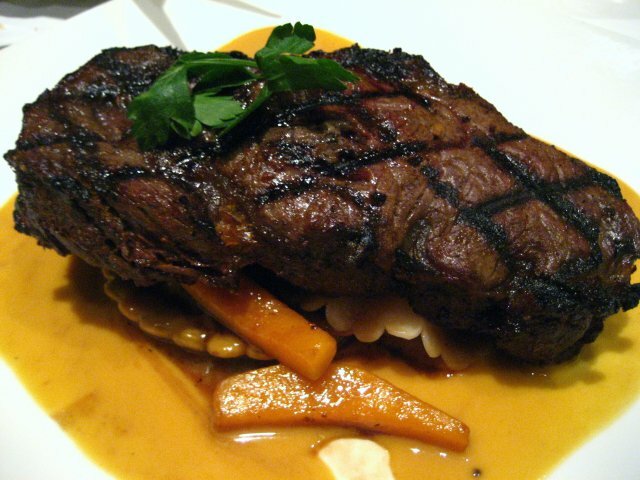 The beef was perfect tender fibers held together by glutinous melted fat and tendon. So soft you could eat it without a knife. My only complaint was the polenta was a touch too salty for my tastes. An enjoyable dessert with a wide mix of textures if a homogeneous in terms of flavor. 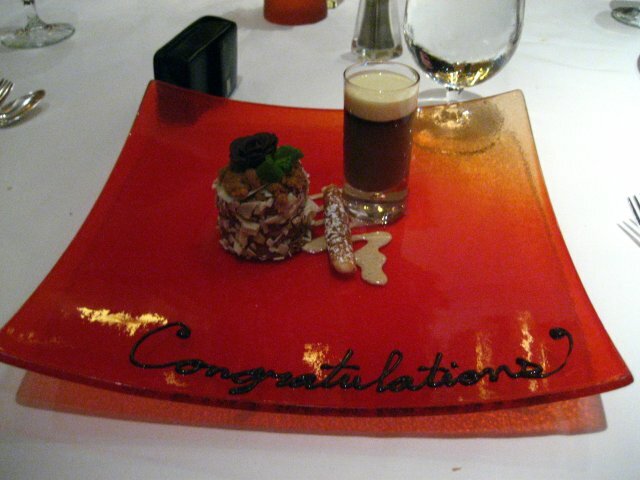 The coffee mousse cake was soft and creamy and came topped with crunchy bits of toffee. 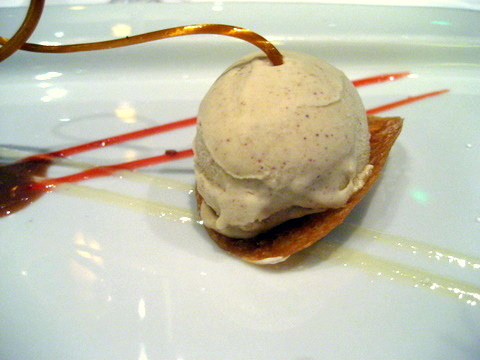 Beside it was a tuille filled with vanilla or some sort of heavy cream. 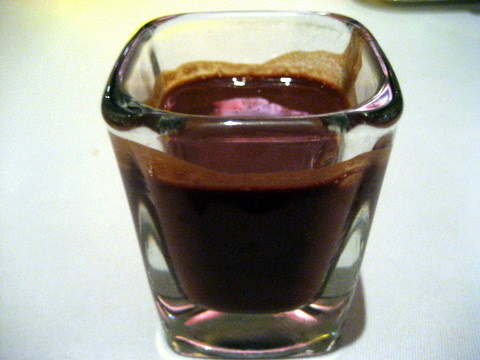 Lastly a thick creamy pot de creme flavored with Baileys Irish Cream. While not as opulent as my previous excursion to this restaurant, this was a fitting and welcome end to the first quarter of school. I am happy to report my group agreed with my assessment and appreciated the chance to unwind and relax with one another. I am happy to report a new record for food expense. In fact the tax alone is more than all but a handful of my previous bills. What could have such an astronomical cost that it renders French Laundry and even Urasawa "cheap" in comparison? Read on and find out. 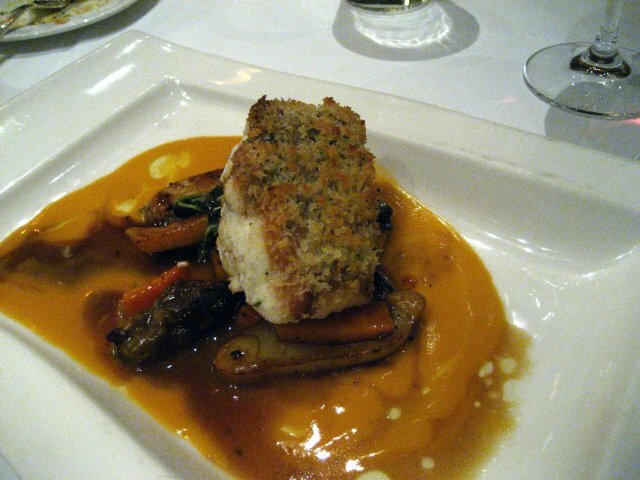 My first trip to Napa Rose was one of my earliest forays into fine dining and one of my first meals with wine yet it stands out as one of my worst dining memories. I remember being thoroughly unimpressed with the food. I wonder how much of that was due to my inexperience at the time. I had just graduated college and was mere months into my first full time job. I ordered the seven sparkling sins and thought they were a colossal disappointment. Perhaps something to do with a mild case of sticker shock. 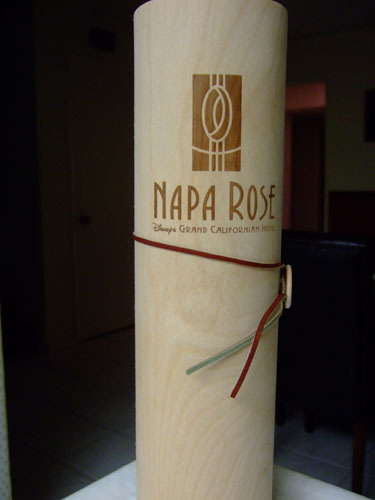 With a few more years and many more expensive meals down my very ample belt, I thought to give Napa Rose another go. I have to say this experience was much better. My friend and I came here almost on a whim. We were planing to go to Grace in Los Angeles but I was too lazy to drive up there. Instead we settled on Napa for no reason other than I hadn't been in a long time (he went recently for a final dinner with his classmates). Our waiter was named Mickey, highly appropriate at a Disney-owned restaurant. For our pre-dinner drinks my friend had his customary mojito although they added a dark color liquid on top(coke?). I tried something new a cucumber martini inspired by the cucumber water at Gustaf Anders. The martini consisted of vodka, with cucumber, dill, and crushed ice, just as refreshing as the water was. I am definitely a man of simple tastes when it comes to bread. Just give me something warm, with a hard crackly crust but a soft yielding center and let me slather it with soft butter. The French bread matched that description exactly. 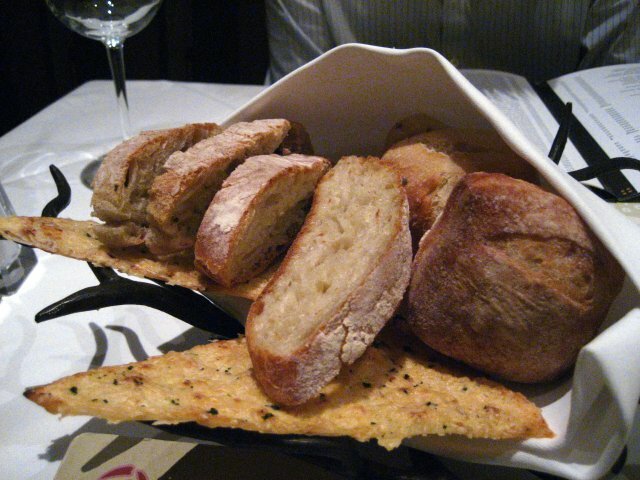 The Ciabatta and olive were both noteworthy as well, but my favorite was the crispy flatbread. Possessing a lightly cheesy flavor it can be eaten plain or paired with a dish equally well. 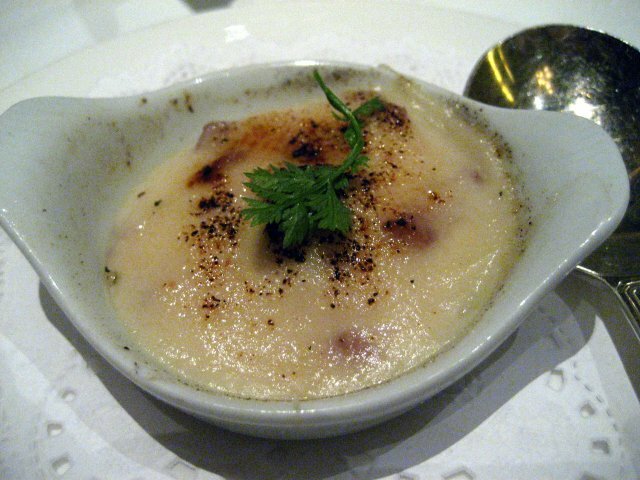 The server who brought these to the table described them as akin to salty creme bruleé. Not exactly a ringing endorsement in my book. Fortunately the dish turned out a bit better than I imagined. The sweetness of the apple was imbued throughout the dish but definitely in a subdued form with the parsnip sage and ham coming out stronger. Our first true course was probably my favorite throughout the night a balanced pairing of varied flavors and textures with no one aspect vying for undue attention. 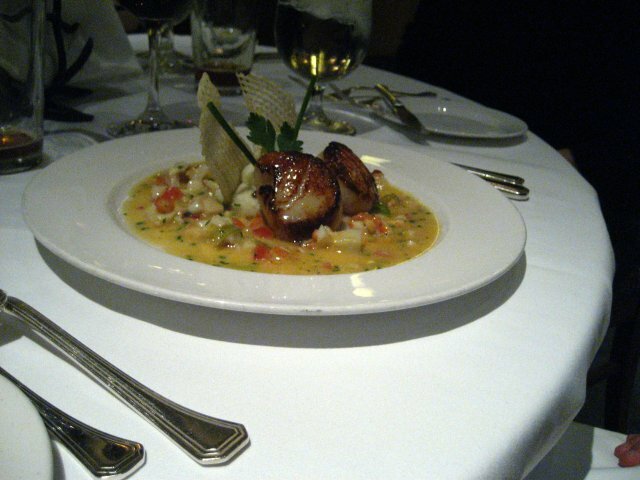 Fresh meaty scallops roasted perfectly with scorching on the outside but still rare on the inside. 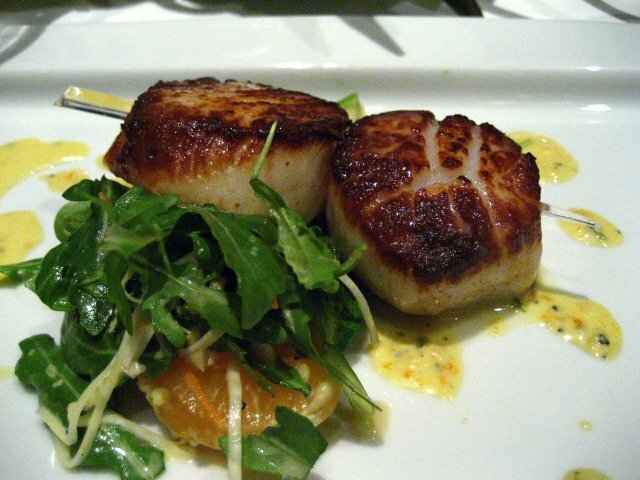 The sweetness of the scallops contrasted sharply yet in an organized and integrated fashion with the bitterness of the arugula and the peppery acidity of the vinaigrette. The resistance of the scallops was offset by the smooth creaminess of the avocado and the light crispness of the arugula. To top it off the wine paired with this was a brilliant example of an albarino, cool and clean with strong notes of fruit from nose to finish. 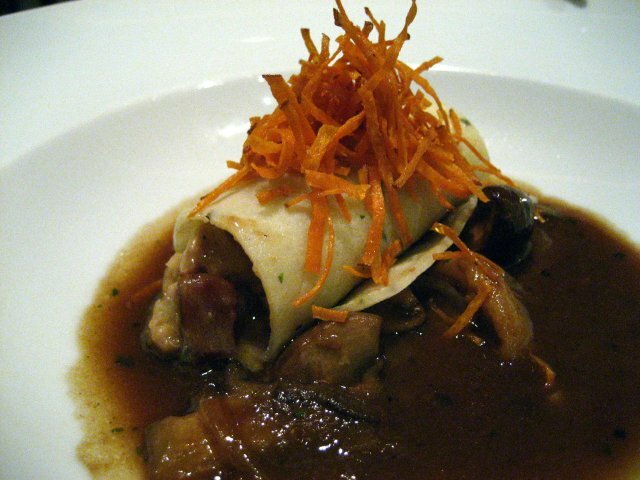 Our second course was a braised pheasant crepe. The pheasant had a smoky rich flavor with a hint of gaminess that seemed somehow appropriate. The texture was soft but not fatty as duck or squab. 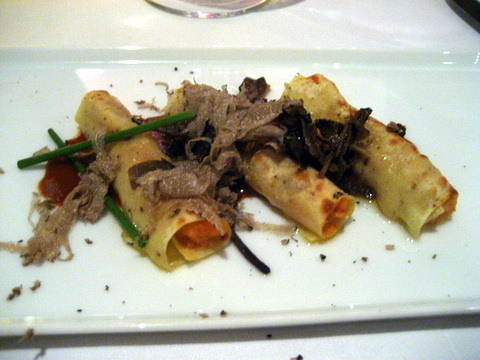 The crepes were perfectly done and the mushrooms and sage added the right amount of earthiness. The wine paired with this was a pinot (a varietal fast becoming a favorite of mine) that had a bit more weight than I am used to, but went well with the crepes and the next two courses. 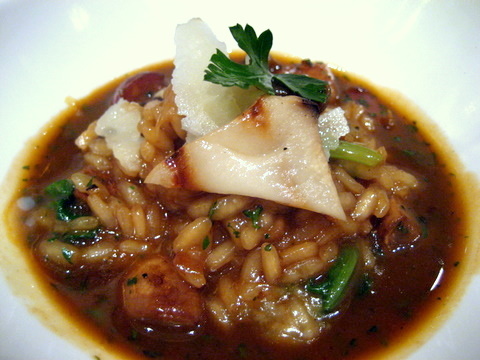 The risotto was a bit of a let down after two very strong courses. I found the rice a bit too hard and not as slick as I would have liked. Having sought out fine risotto time and again with my girlfriend my standards might be a bit high, but I tend to judge risotto primarily on the texture. I mean considering the accompanying ingredients how could the flavor be bad? 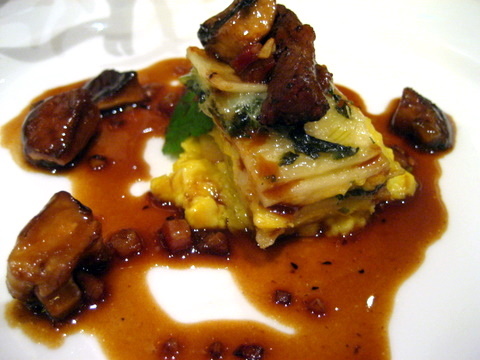 The second supplemental course was a unique preparation of rabbit. The bratwurst tasted well like bratwurst. The sides however were a bit disappointing. I felt the soft grainy texture and cloying sweetness of the squash an unpleasant contrast to the lively spicy flavor of the meat. When we first ordered the tasting menu our waiter came by and told us they were out of buffalo and they were replacing the dish with filet mignon. After consulting with the chef he returned and whispered conspiratorially we have two more pieces would you like them. We happily agreed, I mean how often does one get to eat buffalo. The buffalo steaks we got were huge, easily full 12 ounce portions. 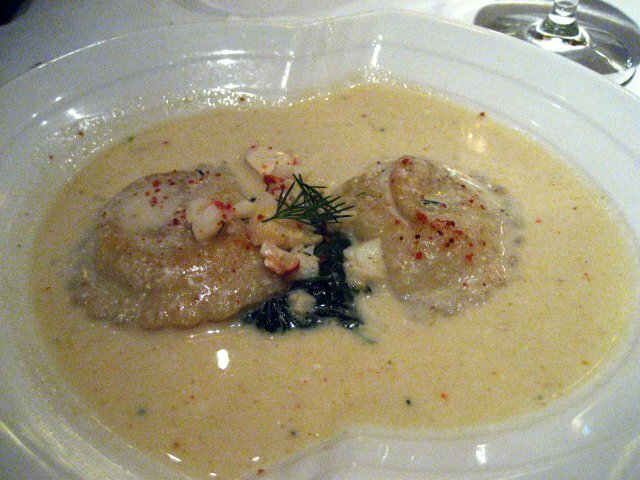 Never having been fond of pumpkin I found the sauce and raviolis overly sweet although I thought the buffalo was flavorful and well prepared. They must have had a busy night because they also ran out of the Rudd that was paired with the wine. Our waiter decided to pour us glasses of 2005 Caymus in place of the Rudd. I found the Rudd very fruit forward with intense flavors, a very typical California Cab. The Caymus was much subtler, with more complex flavors and requiring more effort to decipher, more of an old world type wine. 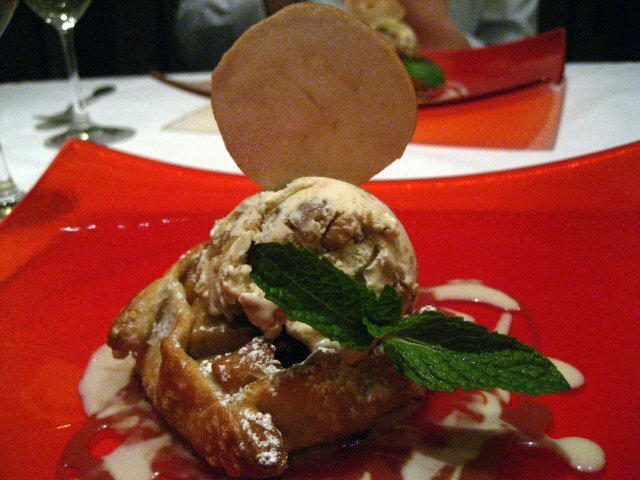 Wine Country Apple Galette - Walnut Ice Cream and "Cider Caramel"
Our dessert was an apple tart with perfectly done dough, the apples were well cooked, a bit on the rare side for a tart but I liked it. The walnut ice cream wasn't too intense adding a simple sweetness with the merest suggestion of nuts, reminding me very much of a sesame ice cream I once had. The wine wasn't too intensely sweet and paired very well with the dessert, remaining drinkable even after eating the dessert. So now we get to the good stuff, the "Wine of the Day." 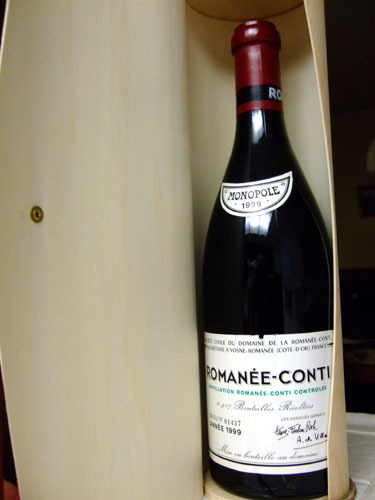 The WotD is none other than 1999 Domaine de Romanee Conti. Perhaps the finest wine in the world and '99 was a particularly good year with near perfect ratings from the major reviewers. 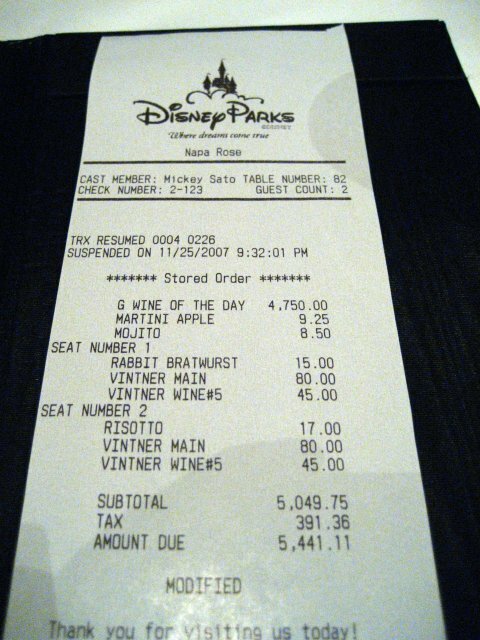 The wine cost $4750, and the resulting tax from the wine was comparable to the cost of the entire meal. Sadly the wine was an investment and the closest I got to tasting it was reading the Robert Parker review. During my second trip to Napa Rose, the restaurant finally lived up to the lofty expectations I once had. The food was well prepared and stayed true to the Californian theme, the wine pairings were impeccable, and the entire meal was a satisfying experience. I would come back, but the only question I have is how can I top the extravagance of this trip.